Last week we came across a leak from evleaks stating that the name of the new device from Motorola and the Moto X successor, would be called the Moto X+1. There was also some information that the new Moto X+1 would be offering a range of different styled backs, but with a new focus on faux leather instead of Wood. As it turns out, we’re learning some new details about the Moto X+1 on the leather back option that users will have to go for this time around. Motorola will reportedly be offering a myriad of styles and colors available for the new Moto X+1 with leather being the newcomer to the group of stuff already available for the Moto X. 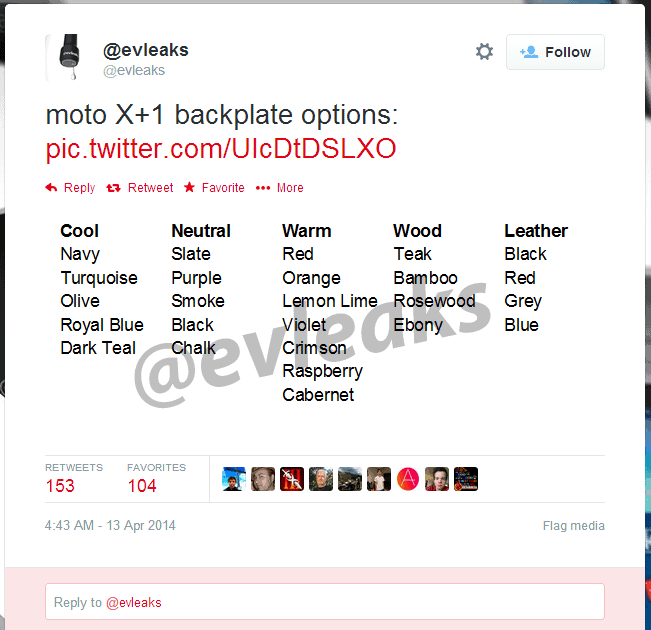 According to evleaks Twitter post this morning, the Moto X+1 will have four color options available for the leather backs. Users will supposedly be able to choose from a leather backplate in either black, blue, red, or grey, depending on which color fits their taste more. Users will also have the option to chose from a wide selection of other backplate styles,-wood styles are still an option- with teak, bamboo, rosewood, and ebony for the wood selection. Those not interested in either wood or leather styled backs will have the option to choose from any number of colors included in the cool, neutral, and warm categories, with colors like Navy, Olive, Dark Teal, Lemon Lime, Cabernet, Slate, Smoke, Purple, Crimson, Chalk, and others. You can see the full list of colors and styles in the image posted down below. 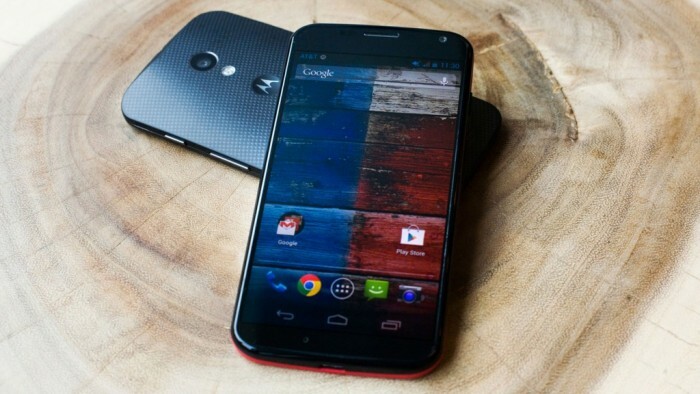 From the sounds of things, the Moto X+1 is going to be just as customizable as the original Moto X, and we honestly expected nothing less. Users will likely be making their style selections for the backs in Moto Maker once the device is launched and have stuff shipped out to them. We wonder if Motorola will decide to offer some more wood and leather styles down the line or if they will stick with the four that are available for each category through the entirety of the device shelf life. So far there isn’t any word on how much these backs will cost or when things will be ready short of a planned summer timeframe, but at least now you can start deciding on which back you want. The post Moto X+1 Backplate Styles Revealed In Leak With multiple Leather Options appeared first on AndroidHeadlines.com |.